Ventura Charter School's goal is to educate our students to participate fully in the Digital Age. We are committed to providing a learning environment that promotes logical thinking, curiosity, global awareness, and self-directed, independent learning. Teachers model effective integration of technology into instruction with the use of laptops, projectors, and document cameras. 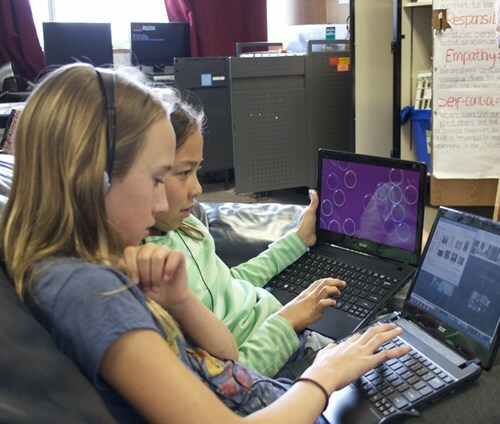 Ventura Charter School's 7th and 8th grade students have one-to-one laptops; 5th and 6th grade students have 2:1 netbooks; and the 3rd and 4th grade classrooms each have 8-10 computers for students to do Internet research for reports, learn keyboard and word processing skills, and progress to networking and collaborating with student peers around the world on educational projects. Technology has changed the way we work, learn, play and communicate; it is fully integrated and utilized in interdisciplinary projects and learning activities throughout the grades. Our students are growing up digital, and by using the tools in which they are proficient, they become more engaged in their learning.